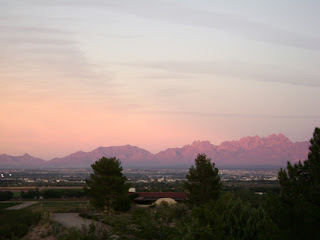 Well, we’ve been here in Las Cruces for a couple of weeks now and have really been enjoying our time here so far. We’ve found all the local Sonics and have our favorite one that makes the best Cherry Limeade. We’ve also found a place called Caliche's that is nothing short of pure evil. Frozen Custard…mmm….good. They advertise as being fat and dairy free, but isn’t custard an egg thing? What do I know? I know it’s good enough that I don’t really care. We are staying at the Las Cruces KOA . This park is completely awesome and the owners are fabulous people. If you are ever in the area and are an RVer or Camper, make this a must stop and try out the park. 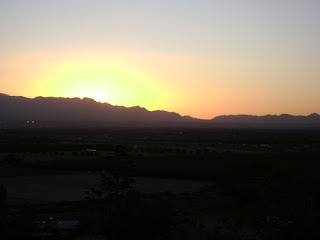 They offer an awesome view of the Organ Pipe Mountains, as illustrated by my pictures here of both the sunrise over the mountains and the sun lighting up the mountains at sunset. Both of these images were taken standing behind out trailer. 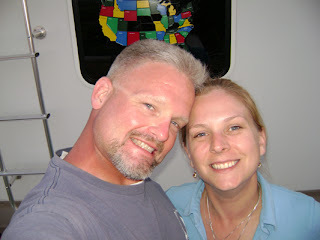 This next picture of Bill and I is taken of us standing at the back of our trailer where the sunrise and sunset pics were shot from. We’ve found several local things that have become something quick and fun to do in a pinch. 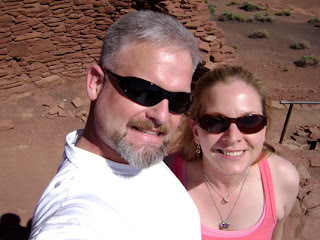 We’ve been down into Historical Old Mesilla several times. They have a market every Thursday and Sunday. It’s a very small market, but the history of the place still makes it fun to visit, not to mention the food. I’ll take and post more pictures as time goes on. 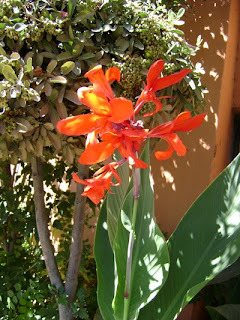 We were walking into the plaza area when we walked right past these flowers. They were so bright and eye-catching I had to take a snap of it. I was going to take pictures of the plaza and the historical buildings and the market, but the honey stand sidetracked me. I found the best local raw honey. It’s produced right here in the Mesilla valley and it’s SO YUMMY. I picked up their Desert Wildflower Honey in raw for my allergies and Bill picked up some of their Red Chili Honey. It’s made from their wildflower honey but they’ve added powdered Hatch Red Chili’s. It’s amazing! Check them out at: www.zianet.com/sunmountain Another place that side tracks me when we go into Mesilla is The Chocolate Lady, need I say more? Evil, strictly evil…but OH SO GOOD! I tried to find a link to her online, but couldn't find it anywhere, I'll have to ask her the next time I'm in there...maybe today. Moving along to my birthday...I knew that I wanted to go out to dinner for my birthday but I wanted to go where the locals go, not particularly where the tourists go. I asked around and had several people recommend Andele’s . I’m SO glad I listened. The Mexican food here near the border is different from what I grew up with in the Pacific NW. They cook with different spices here, or maybe they just taste different here. They also use a lot more salsas and sauces in the preparation of their food. I DIG IT! In the Pacific NW they cook primarily Jalisco style, which is a lot of cheese and ingredients, and light on the seasonings and sauces, I would always pick my favorite restaurants by their salsa since I was going to dump it all over my food. Here I don’t have to do that. The food here is awesome and Las Cruces is likely going to make my “10 places that make me fat” list. Good thing I joined a local Curves and have been working out, I’m going to need it. 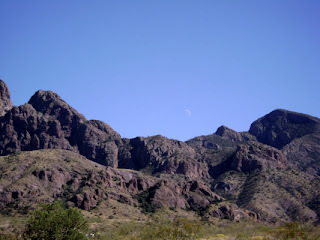 Before gorging ourselves at Andele’s, earlier in the day we drove out to Dripping Springs Natural Area. We weren’t sure what to expect exactly and ended up deciding we’d have to come back another day to do the long trail (about 2+ hours). 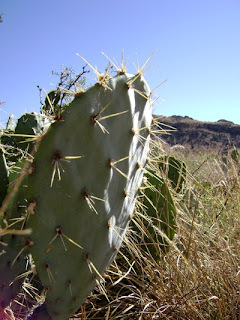 Instead just walked the 1-mile round trip trail out to La Cueva. 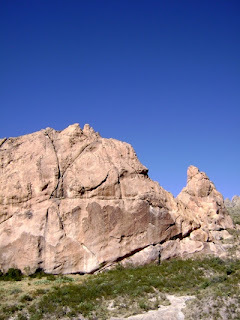 The history of La Cueva is interesting, definitely read about it. One thing they don't mention is how the hermit used to light a fire every friday night so the villagers knew he was still alive. One friday the fire wasn't lit, so they sent some men up to check it out. They found the hermit dead at the entrance to the cave holding his curifix with a knife in his back. They still don't know who killed him or why. When we visited Dripping Springs, it was a gorgeous day, high in the upper 70s, lower 80s, and the sky was such a deep blue. You don’t find skies this blue anywhere else but in the desert SW, incredible. 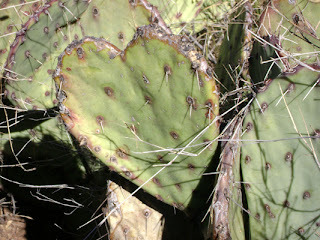 Along the path Bill took a couple of pictures of the Prickly Pear Cactus, and a heart shaped Prickly Pear that he noticed as we walked. I really enjoyed by birthday, we’ve really enjoyed the couple of weeks we’ve spent here so far, and we are looking forward to experiencing more. I have several more restaurants I want to try, and of course as many trips to the The Chocolate Lady as possible. Well, here we are in Las Cruces, NM. We will be here for about 6months. 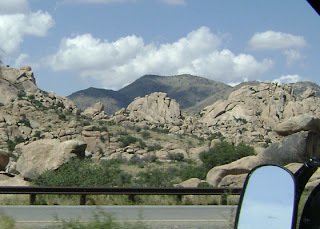 I haven’t loaded any NM pictures yet, but did snap a few as we were driving through southern AZ. 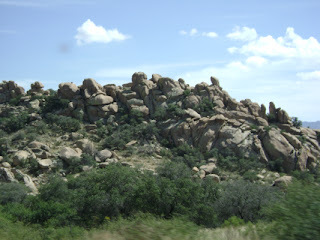 These are rock formations that are just south of Benson, AZ along I-10. We’ve driven past them countless times, and always said we should stop to take pictures, but never do. I figured I’d give it a shot out of the truck window at 70 mph. Only a couple of them turned out, most of them were blurry. At least I tried. This post will be a short one, we’ve spent the last couple of weeks getting settled into the area and into the park. I’ve been busy getting ready for the farmers and crafts market here in town, there was a lot of paper-work stuff to do, now I need to concentrate on building inventory and variety. For now that will be my sole purpose in life, build inventory and variety to sell at the market. Other than that it’s been pretty relaxing. Bill snapped some shots of our view last night, but I haven’t downloaded them yet so I have no clue if they turned out or not. We are backed up to a view of the Organ Pipe Mountains and they sure are pretty when the sun is setting, they glow pink and orange, it’s beautiful. I’ll have Bill keep trying to take pictures until we get some really nice ones, especially with his camera. Gotta run for now, I have work to do. The last week of September was a busy one for us. After skipping Las Vegas, we drove into Kingman, AZ. 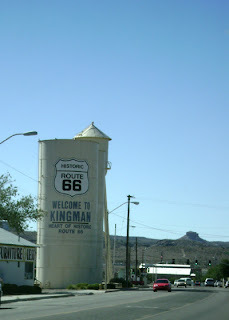 Kingman is one of the towns along the original Route 66, the Mother Road. I’ve enjoyed the times that we’ve visited towns along old Route 66. I only wish I could have seen it in it’s prime. Kingman is still alive and well, but the main road through town isn’t Route 66, you kind of have to drive to the ‘other side of the tracks’ to even find it. Once you do though there are still some diners and nostalgia to be had. Both times we’ve been through Kingman we’ve stopped and had lunch at Mr. D’s. 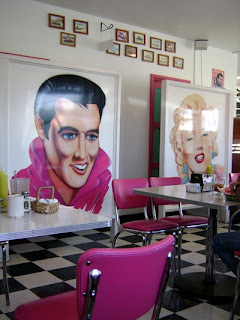 It’s a nostalgia diner that has AWESOME burgers at very reasonable prices. I just like the way they mark the bathrooms. Don’t forget to try their homemade root beer and sweet potato fries….mmmmm…….beer and fries! From Kingman we drove into Williams (not far from Flagstaff). Williams is another Route 66 stop, but we didn’t do any of the 66-nostalgia stuff this time around. Instead we visited the Grand Canyon. 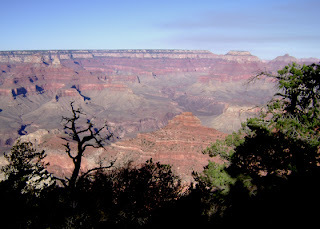 The Grand Canyon is nice, but really just a large hole in the ground. I personally like the view from an airplane better, you get to see the true size and depth of it. It would probably be a lot better experience without all the people, but what are you gonna do? 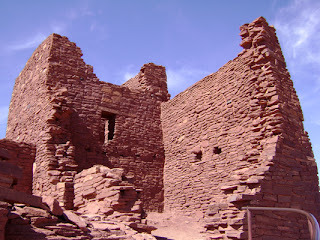 By far my favorite trip from Williams was out to Wupatki National Monument . What an awesome place! There is a lot to see and do and I’m glad that we took an entire day to explore this area. We started with a picnic at Sunset Crater Volcano. 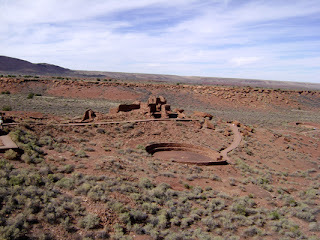 From there we drove into Wupatki and stopped at every pullout you could stop at. I drug Bill all over the desert that day, but he didn’t mind. He had been there years and years ago, but got to see stuff with me that he hadn’t taken the time to see before. So it was both new and cool for both of us. I think I appreciated the fact that you could really explore some of these places, that probably won’t stay that way as the area get’s more popular, people ruin everything. Despite the signs that say not to disturb, touch, or remove the historical items, people still do. 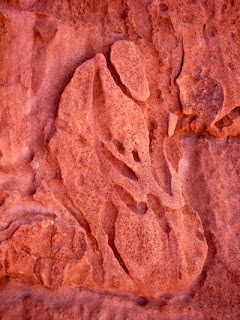 They think ‘taking just one thing won’t harm anything’, what they don’t think of is that if everyone has that attitude that’s millions of people removing ‘just one little thing.’ So I beg you, if you visit these places, leave only footprints and take only pictures! Here are a couple of pictures of Bill and I. First the picture of both of us, can you tell by the blinding whiteness that we’ve spent the last 9 months on the Oregon coast? Sunscreen, lots and lots of sunscreen! 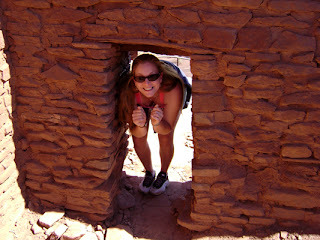 The second is to illustrate how tiny the doors of these house-ruins are. I’m 5’10” tall in bare feet, those doors were tiny. Well built though, I was astounded by how cool the rooms that still have walls stayed. It was easily in the upper 80s, lower 90s that day, but those rooms where comfortable and almost chilly. It was fun to learn about how and why they built the way they did. I think history needs to rethink its view on calling ancient peoples primitive. 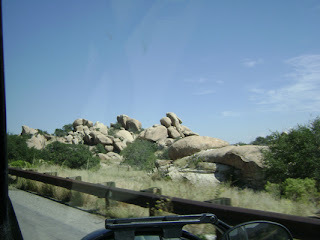 I also really liked the natural formations the rocks would take. 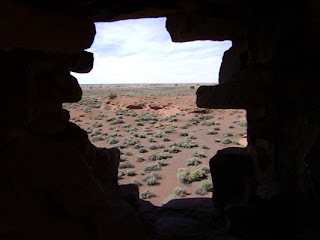 I was walking along a path at the Wupatki ruins and saw this person in the rock. If you look it looks like a lumpy-person on their knees, it’s kind of like finding shapes in the clouds. 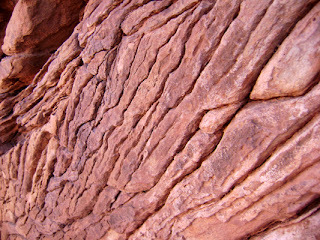 Bill took the picture of the rock lines, I really liked the way it turned out. It’s such and amazing place, I only wish I could show you pictures that really does it justice, but like so many other places and things, you really have to go there yourself to experience it. Ok, I’m almost ready to finish up this installment. But first I have to post a picture that Bill took so you get his point-of-view while driving. I thought it was a cute idea so I had to post the image. He really doesn’t get to see as much as I do since he has to pay attention to the road and keep us alive and all that. 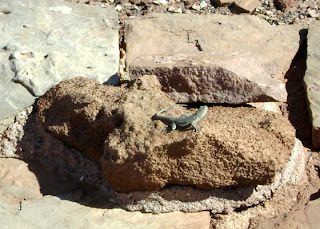 The last pictures I’m going to post are of a couple of lizards in Wupatki. 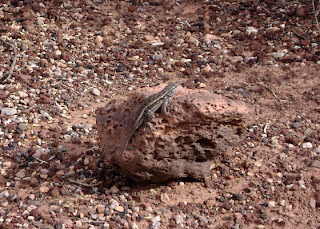 Lizards are EVERYWHERE in the desert, but I think they’re cute, so here are these pictures. That’s it for now folks. 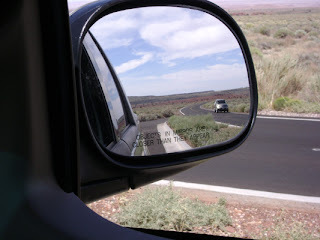 I still have a post about our trip from Phoenix to NM. Hopefully I’ll get that posted in the next couple days.